Letter Quest is a title that combines the charm and adventure of a role-playing game with the strategy and brain crunching of a typical puzzle game. Originally released on mobile devices in 2014, it has now been remastered for the Nintendo Wii U. 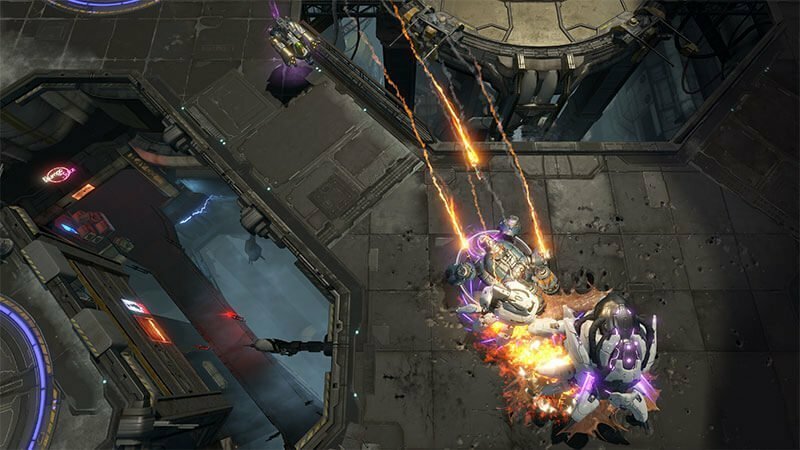 While the title has its appeal, it can become repetitive and does not fulfill all the desires of either the puzzler or RPG gamer picking up it up. In Letter Quest, the adventure begin with a short, grim-reaper looking character, appropriately named Grimm, wanting to get some pizza. Seems simple enough. For some reason, however, he has to make his way through a forest, a graveyard, and even a secret lab to get this pizza. All of this takes place while villainous rabbits lead a force of ghosts, zombies, and other creatures to try and stop him on his journey. If there is some mythological history between the grim reaper and rabbits, I don’t know what it is, but the character art is cute and it all works out. 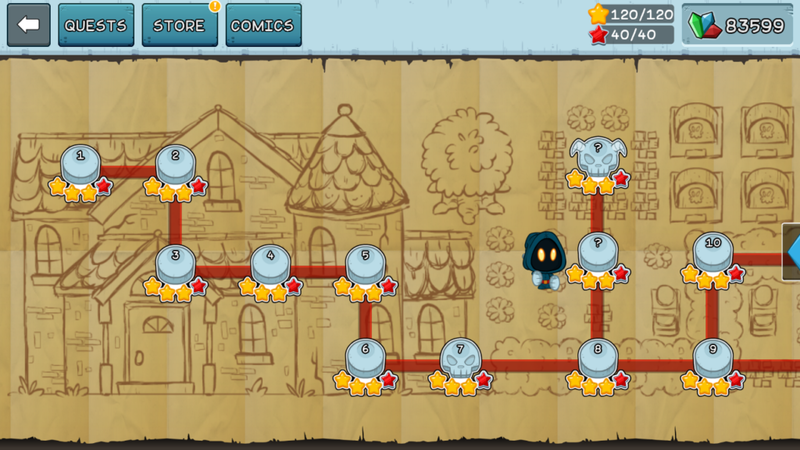 With the gameplay, the player has a world map with linear stages that get harder as you progress through the game. Each stage has the player walking from left to right and meeting a couple of bad guys on the way. Once you meet a bad guy, you are given 15 letter tiles and must spell out a word. The better the word, the better the player’s attack on the enemy will be. This is helped by using rare letters, like Q’s and X’s, but is mostly determined by length. As with many games, each enemy you defeat will give you experience and cash, which you can than use to purchase more items and passive abilities to help you progress through the game. Unfortunately, that’s really it. 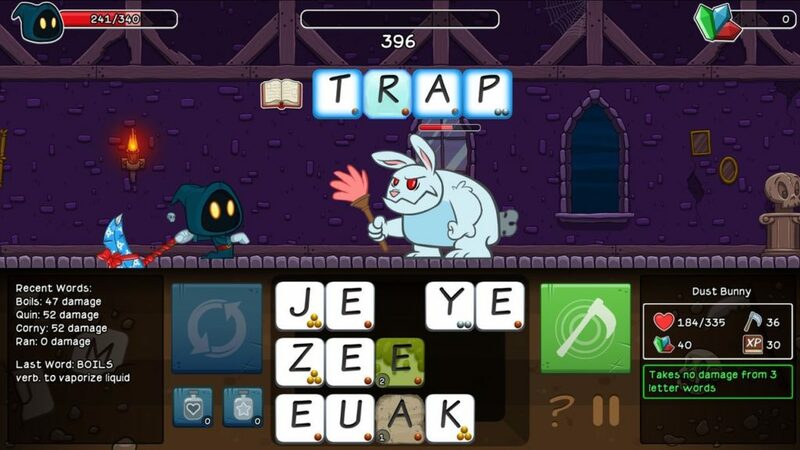 Letter Quest feels like a single player version of scrabble with a couple of nice added role-playing elements. You can get potions to heal yourself and cure the tile of certain ‘ailments’ enemies can put on them, or you can take a turn to swap out the tiles you have for new ones. Besides that, there is only one job: Take your letters and spell out the best word possible. Yes, you can purchase different weapons and rank up health and attack, but any new abilities you gain are all passive. While there is nearly an endless amount of words to possibly spell, that doesn’t stop it from becoming repetitive, especially considering it is a single player game. Throughout Letter Quest, certain bad guys can warp your tiles, either by poisoning them or adding some other strange effect. There are not that many challenges within this though. There is more than one tile effect that simply hurts the player when you use them, and some others seem like a stretch. For example, one just flips the tiles upside-down, making them slightly harder to read. It doesn’t take more than a few seconds to realize what the tiles are. More than these ailments, certain enemies have conditions for being defeated, such as attacks being doubled by words with the letter ‘s’ or something along those lines. There are about forty stages in all, including some that are off the main linear path. They can be challenging towards the end, but once they have been completed, the only thing bringing players back to Letter Quest is the Endless Mode. This feature is exactly what it sounds like. You move forward and keep taking out enemies with words until your health is depleted. 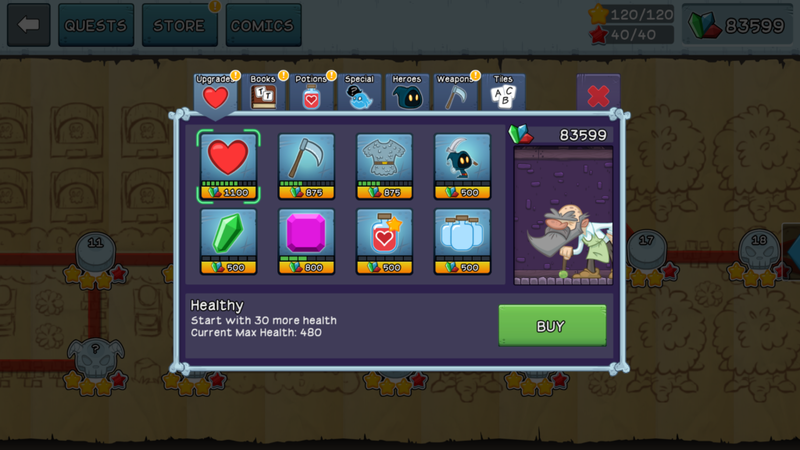 There are merchants along the way that you can buy health from and upgrade your statuses, but you are still essentially spelling words until your defeat. While there is no multiplayer mode, this can be fun to play with a friend and see who can get farther. You’ll have to remember the number of enemies you defeat or words you’ve spelt for yourself though. Overall, for $9.99 Letter Quest is an enjoyable game if you are the type of person who wants to extend the boundaries of their vocabulary. Any self-proclaimed Scrabbled champion will love it. It is not nearly as deep, however, as any mainstream role-playing game. It also does not bring about new challenges as any good puzzle game should. For those reasons, Letter Quest falls short of satisfactory. Decent. While there may be some good things about these games, the bad far offsets the good. Fans of the genre may be interested, but it’s a rental at best. While Letter Quest has some charm and is a fun way to work on your vocabulary, it is not deep or addicting enough to keep players coming back for more. This game was reviewed on the Wii U, using a copy provided by the developer.